Word of mouth marketing is — and has always been — the most effective (and cost-effective) way to generate customers and grow any business. But for a long time, word of mouth marketing has been mostly ignored in favor of outbound and inbound acquisition efforts, plus a big shift toward social media. The truth is that social media and word of mouth marketing are NOT THE SAME THING any more than toothpaste is the same as a toothpaste tube. Word of mouth is the toothpaste; social media is the tube. It’s a container for word of mouth (data from Engagement Labs shows that about 50% of word of mouth occurs online, and 50% occurs offline). With the future of social media changing, it will be nearly impossible for businesses to generate exposure online without paying for it. At the same time, we trust each other more than ever, and we trust companies less than ever. Also, word of mouth marketing is most popular, and most impactful for younger consumers in the Millennial and Gen Z cohorts. Of course, if these are not your customers today, they most definitely will become your customers eventually. All of this means that the key to business growth now — and even more so in the future — is word of mouth marketing: getting your customers to tell your story so that you don’t have to tell it yourself. But, that’s where it gets tricky, because nearly all businesses go about word of mouth marketing the wrong way: by focusing on quality. The more you try to fit in, the more your customers tune out. One of the great mistakes we make in business is playing “follow the leader.” Best practices are massively overrated, especially in the area of customer experience. Competency doesn’t create conversation. Nobody EVER says: “Let me tell you about this perfectly adequate experience I just had.” Why? Because that’s not a story worth telling. 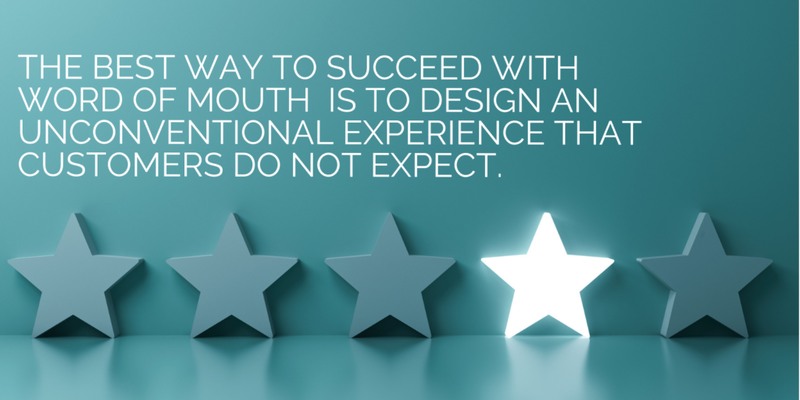 The best way to succeed with word of mouth marketing is to design an unconventional experience that B2B or B2C customers do not expect. Same is lame. People are wired to discuss different and ignore average. If you want your customers to tell their friends about your business (and you do), you need to give them something interesting to discuss. We call these unexpected customer experiences Talk Triggers, and through our word of mouth consulting, we help companies and organizations around the world develop, test, and measure the impact of these programs. 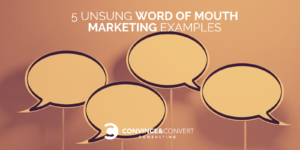 Because word of mouth marketing still flies under the radar in many instances (even though it was the first-ever marketing approach), there are a shortage of meaningful, relevant, and timely case studies. I find and spotlight a new word of mouth marketing example on my weekly video series (also a podcast) called The Talk Triggers Show. Consequently, I’ve collected a library of nearly 100 great examples of word of mouth, and I’ll share five with you here. Note that in Talk Triggers — the book about word of mouth marketing I wrote with Daniel Lemin — we segment word of mouth examples into five categories. Each category is way that you can exceed/defy customer expectations to spur conversation. Word of Mouth Example: Dr. Glenn Gorab calls each of his patients the weekend BEFORE their visit. People HATE going to the dentist. And 58% of us say we’re scared of the dentist. Now imagine you’re not just a dentist, but an oral surgeon, in charge of extracting and implanting and cutting and pillaging. And what if you were an oral surgeon in the most crowded and competitive market in America: the New York City metro area, where – in just the city alone – there are more than 2,900 other surgeons? This is the daily challenge faced by Dr. Glenn Gorab: how do you get new patients when nobody WANTS to be a patient, yet there are competitors everywhere?! Glenn’s office is in Clifton, New Jersey a city of about 85,000 people that’s just 10 miles from New York City. It’s surrounded by other cities and lots and lots and lots of oral surgeons. But Glenn has succeeded in this quest. He is wildly successful. His practice has been steadily busy for more than 32 years. And he has NEVER been sued. Ever. Despite the fact that more than 99% of high risk surgical specialists will face a lawsuit in their career. 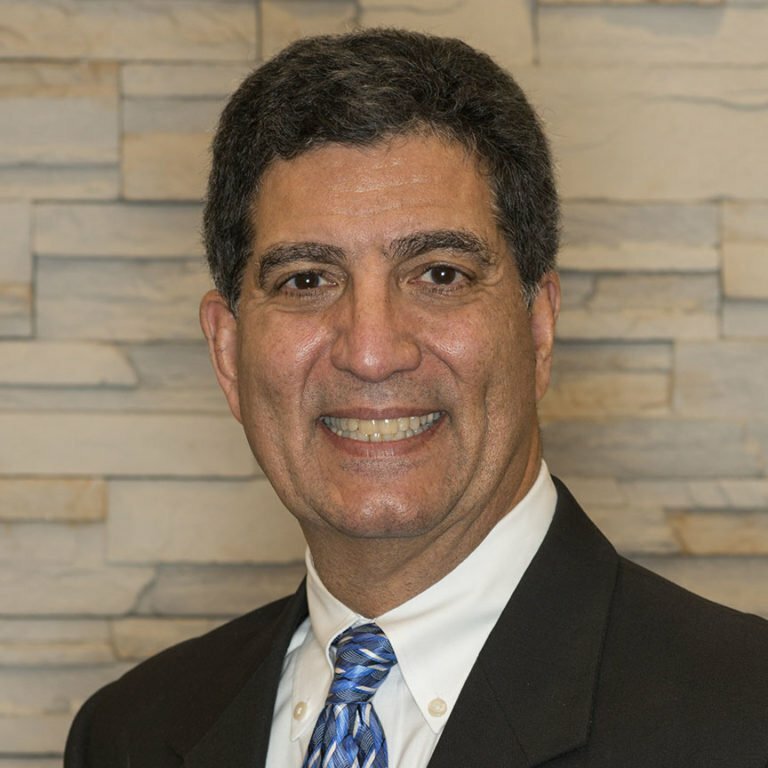 How does Glenn Gorab demonstrate caring for his patients, disproportionate to the thousands of other surgeons in his area that perform precisely the same services? But you have NEVER had a doctor call you BEFORE you ever even set foot in the office. It’s simply not done. But why not? It makes a huge word of mouth impact. And, 80% of patients mention the calls once in the office for their appointments. Word of Mouth Example: Get your nails done and your brakes fixed—all at once, and all by women—at Girls Auto Clinic and Clutch Beauty Bar in Upper Darby, PA. In Philadelphia alone, there are 1,182 auto repair shops. How can you stand out amidst that sea of overalls and oil changes? Other than being certified to work on particular vehicle brands, how can auto repair places differentiate? How can they stand out and create conversation? That’s the challenge faced by Patrice Banks, who owns a Philly-area auto shop. But by making unconventional choices, Patrice has not only built an incredibly popular business, but has been featured in The New York Times, written a book, been interviewed by Terri Gross on NPR, and has given a rousing TED Talk. But how? Of the more than 1,100 competitors in Philly – not to mention the 229,000 other auto repair places in the United States — how was Patrice Banks able to get to the head of the pack using customer conversations? First, Patrice understands that if you try to be all things to everybody, you end up being nothing to nobody. Relevance is the rocket fuel for word of mouth. Patrice used to be an engineer at DuPont. But she didn’t know anything about cars. She didn’t want to take her vehicle to an auto shop and perhaps get taken advantage of as a female that didn’t have a lot of car knowledge. So, she taught herself cars at night, and eventually started a shop of her own that employs an all-female team of mechanics. Smart. After all, women represent 51% of drivers, but just 2% of mechanics. She knew her customer audience, and she knew their pain points, because she used to BE the audience. And then she built a business that catered EXACTLY to those circumstances. But Patrice is not satisfied to rest on her previous accomplishments. After becoming the Pied Piper for what she calls SHEcanics, Patrice took aim at the auto repair waiting room. 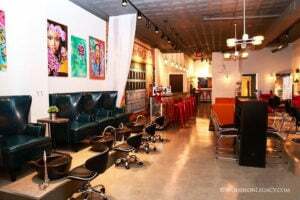 She knew she could give her customers a better way to spend time while their vehicles were being worked on, and so she knocked out a wall and built a brilliant, talkable alternative: a full-service salon with hair, nails, facials and more, called Clutch Beauty Bar. 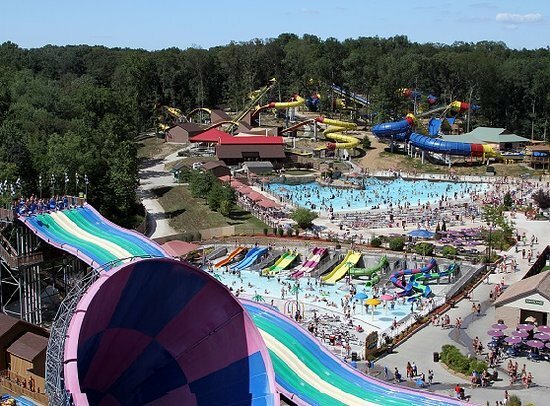 Word of Mouth Example: Soft drinks are completely free at Holiday World and Splashin’ Safari in Santa Claus, IN. Let’s imagine you owned a theme park. To give your new business the best chance of success, you’d want to locate it as close as possible to major population centers, right? But what if instead, your theme park was located far, far, FAR away from just about anything? What if your theme park was, for all practical purposes, in the middle of nowhere? That’s exactly the business challenge for the Koch family. Since 1946, they’ve been the owners and proprietors of a theme park located in Santa Claus, Indiana. Population of Santa Claus? Two thousand four hundred and eleven. But they make up for it, and then some, because what the Koch’s understand perhaps better than anyone in the theme park and attractions industry is that the best way to grow ANY business is for your customers to grow it for you. If you give your customers a consistent and memorable story to tell, they’ll tell it. What story do customers tell about the Koch’s family business? Soft drinks are totally and completely free. On the grounds of the park and inside the restaurants, there are 924 drink dispensers. All of them free. This unexpected, operational decision is the number one story customers tell about the Koch family business. In fact, an incredible 43% of all reviews for Holiday World on TripAdvisor.com mention free drinks specifically. Word of Mouth Example: Pal’s Sudden Service hands food to customers 18 SECONDS after the order has been placed at the drive-thru menu board. Speed is perhaps the most difficult style of word of mouth marketing, because customer expectations about speed continue to escalate. This is even more difficult when you operate in an industry that is already known to be quick, such as fast food. This category of business even has FAST in the name! But that doesn’t deter Pal’s Sudden Service, the fastest fast food anywhere. How fast? This chain of 29 location in Tennessee and Virginia has an average order delivery time of 18 seconds. 18 SECONDS between the order being placed at the drive-thru menu board, and the food being handed to the customer. 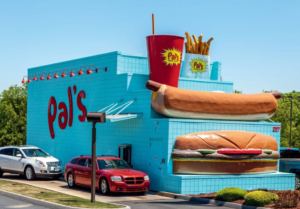 Twenty-seven Pal’s locations are drive-thru only, which helps them optimize for talkable speed, but even with that natural advantage, 18 seconds is mind-warpingly quick. But being fast without being competent can create negative word of mouth. And you’d expect that an 18-second average delivery would result in compromises in accuracy, and quality. According to Harvard Business Review, Pal’s has one order accuracy error for every 3,600 customers. The average for fast food drive-thrus: one error for every 35 customers! So the fastest of the fast food operators is also 100 times more accurate than the average fast food outlet. Word of Mouth Example: A folk band in Nashville sells out shows EVERY SINGLE NIGHT by dressing up entirely as MUMMIES. Imagine you’re leading a band of musicians in Nashville, Tennessee. You don’t play country, far and away America’s most popular genre at present. No, you play funk music, which has a somewhat limited appeal with occasional examples of crossover stars, like James Brown. And also imagine that there are 8 dudes in your band, forcing you to split the money you make from concerts and hoodies into a bunch of smaller chunks. Imagine too that everyone in your band has another job as a session musician in Music City. You can’t travel wherever or whenever you want. You have to stick to the southeast and Midwest United States so as not to be too far away from Nashville. Lastly, imagine that even though many of your bandmates have won Grammy Awards for their excellence in the recording studio, the identities of all 8 band members must remain a secret, because their session musician contracts actually prohibit them from touring with another band. Amidst all of those obstacles, the questions are two-fold: HOW could you possibly succeed, and WHY would you even try? But this band does more than try. They slay. Their fans are incredibly loyal and go out of their way to recruit others to the tribe. What is the band’s recipe for selling out shows almost every single time and becoming known as one of the best touring live bands in America? 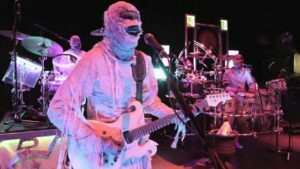 For 19 years, across 9 studio albums, for more than 1,000 live shows, this band takes the stage entirely, exclusively, and completely as … mummies. The band is called: Here Come The Mummies. There you have it. 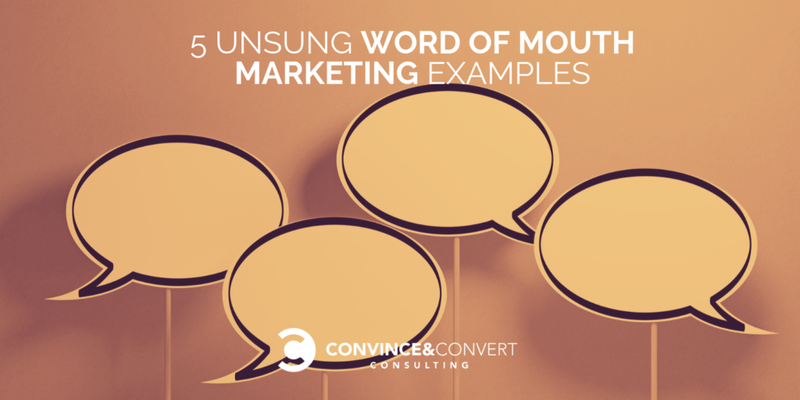 Five word of mouth marketing examples, one for each of the categories.